The equestrian world is unique in both its practice as well as its values. It always requires two athletes, horse and rider, and both men and women participate or compete against each other on equal terms. The FEI, the world governing body of equestrian sports, states: "...with over 750 million equestrian fans worldwide, horse-related events provide a unique platform to engage with a predominantly female (75%), affluent, trendsetting and global fan base that consider equestrianism to be an integral part of their lifestyle. These demographics are consist across all key markets, with families in particular often flocking the gates to witness the sport in action." 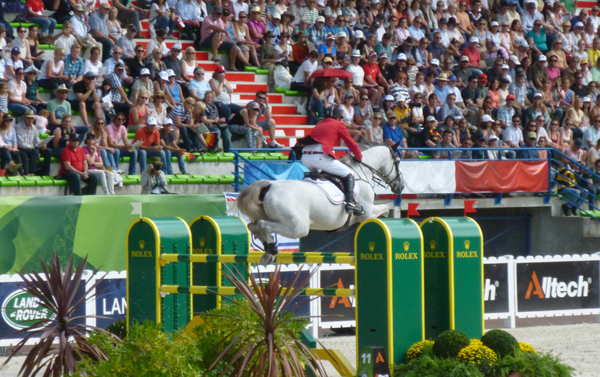 Although show jumping is the most popular worldwide, there are several other high-level equestrian disciplines. The best known are those included at the World Equestrian Games held every four years: in addition to show jumping, there is combined driving, dressage, endurance, eventing, paraequestrian events, reining and vaulting. Officially introduced into the Olympics in 1912, this sport has been growing ever since. It is an exciting sport, and competitions are held year-round all over the world. North America is no different as numerous horse shows are hosted every week, with key competitions and circuits being followed by the elite riders to earn money and to qualify for national and international events. Many horse shows feature thousands of riders, horses, and spectators. The value of horses there ranges from thousands of dollars all the way to several millions. Sponsorships are common, and are actually the primary financial means for many riders to perform at the highest level. Sponsorship packages are customized to match specific needs—from startup companies to international entities, to promote a brand or advertise products, etc. Horse shows are great places to network, create new business relationships, and be introduced to an affluent market. Leverage sponsorship to include several events, riders, objectives. Sponsors will be acknowledged on: show carts, horse names, show rugs & saddle pads, show cups/trophies, jackets, training rugs & saddle pads, shirts, hats, FEA’s official vehicles, etc. Conventionally, sponsors need cash to sponsor; but FEA's structure allows many other options that could help a company sponsoring without having to dig into its needed cashflow or reserves. Here pretty much any type of funds and assets may be used for sponsorship: cash, services, products, endowments, properties, hard assets, discounts on products/services, excess inventory, accounts receivable, transferable tax credits, donations, inheritance, insurance policies, precious metals, vehicles, trailers, equipment, services, etc. Think of it as a sponsorship conglomerate offering added power to each sponsor dollar. When sponsoring FEA, you are sponsoring much more than the Foundation itself and what it stands for. You are sponsoring a team, horses, associated services, equine therapy and a lot more. Your sponsorship may be targeted for a specific purpose, or general. FEA partnership provides sponsors with a great way to promote their brand and strengthen their position in the market. Partner companies also benefit from unique opportunities to showcase their products and services while creating an emotional connection with the very passionate equestrian audience.